... And In My Spare Time I Quilt: I Haven't Disappeared! I can't believe it's been over a year since I last posted. A lot has happened in my life during that year, starting shortly after my last post and culminating in my retirement in December 2013. It's all water under the bridge and I am SO happy to be retired with lots of spare time to quilt. The daughter of one of my oldest and dearest friends got married in November, so of course I had to give her a quilt. With everything that was going on during that time, I decided to pull out a top I had made during a retreat earlier in the summer. I had intended to get it quilted to take to the wedding in Baltimore, but just couldn't get it done. So it sat ... and sat ... and sat .. until March, when I finally put it on the frame and got it quilted. It took a few more days to bind it, then all that was left was the label. A label, no big deal, right? Hah! I usually custom print labels for wedding gifts to include a photo of the couple along with the date and place of the wedding. I keep an old ink jet printer and a bottle of Bubble Jet Set just for that purpose. The bride's mom sent me a picture from the wedding and I prepared everything for printing -- white fabric treated with Bubble Jet Set ironed on to a freezer paper sheet to enable feeding it through the printer. But the printer wouldn't print black. Color was just fine, but no black. The cartridge was new, but I replaced it anyway. Still no black. I found some hints online to clean the print head, which I did. Still no black. After much frustration, many sheets of paper (always test first before printing on fabric), two cartridges and several days, I finally gave up and printed a simple text label in dark blue. 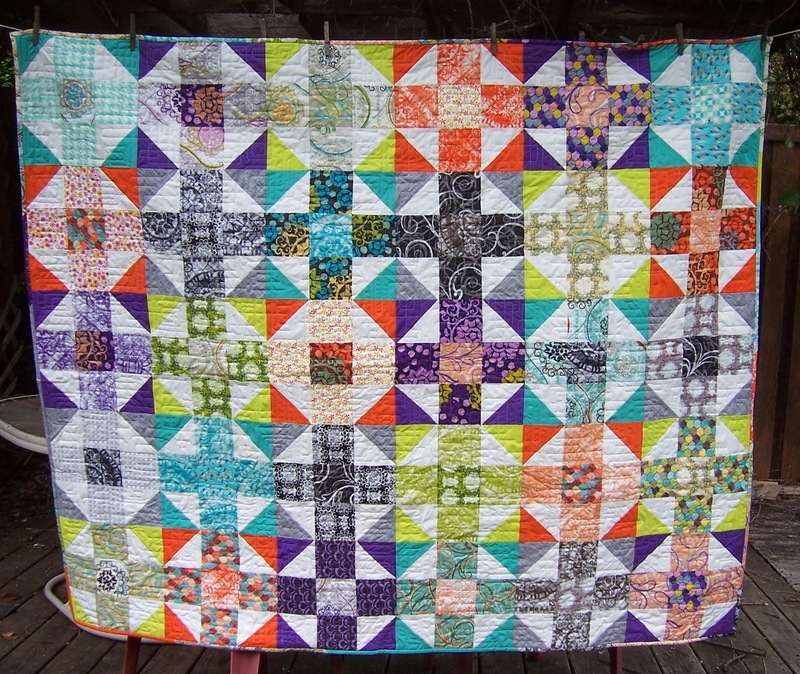 So, here is the final quilt. I mailed it off, and my friend said they received it, but I haven't heard anything from them yet. I do hope they liked it! The pattern is Mod Nine Patch from Don't Call Me Betsy. The quilt measures 60" x 72". Lovely quilt! I can't believe it's been so long since Renee and I came to visit. Happy retirement. Come sew at the church if you can.